← We were walking on what now? 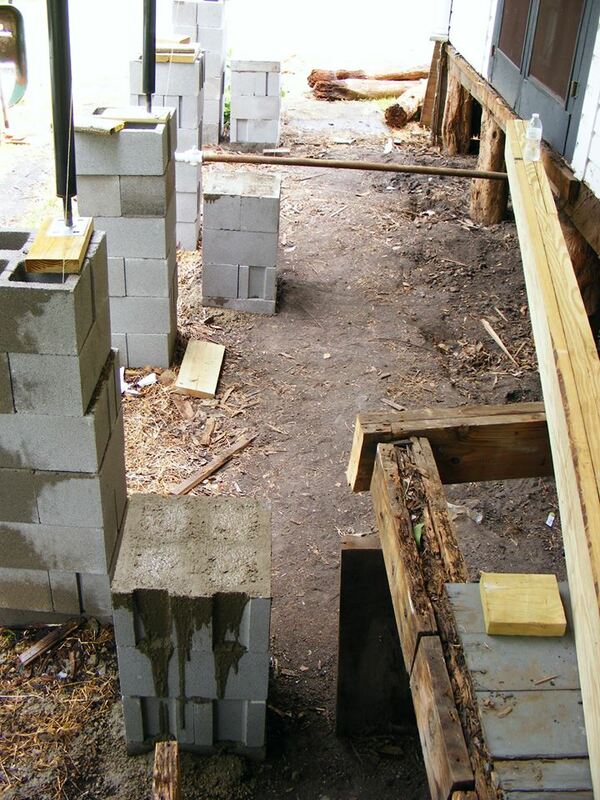 I didn’t get as far on the framing as I would have liked this weekend…with Mike’s help I got the front beam for the porch built, the piers set and filled with concrete…and the old bodarc pilings removed. The heat caught up with me at that point…although I didn’t realize it had gotten that hot the heat index had gone to 109. First, we pulled the old bodarc piers. 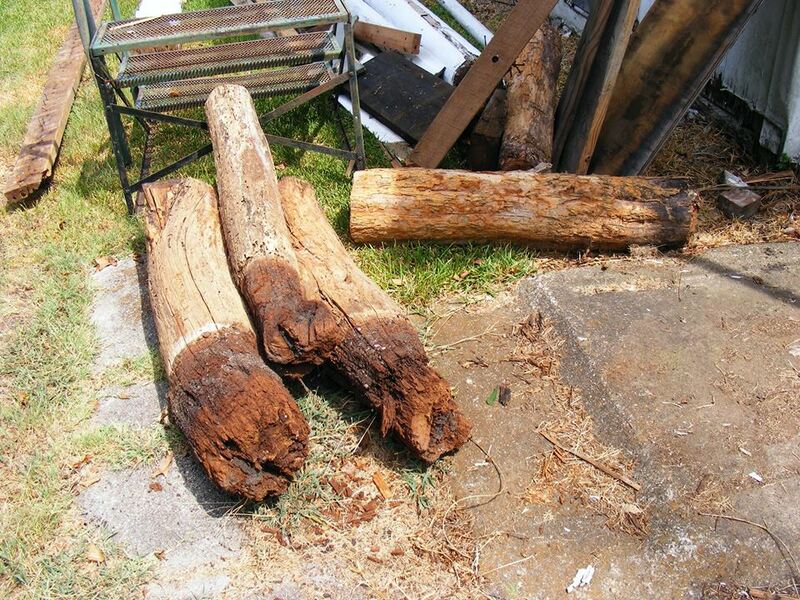 Genuine ur…decorative antique pilings anybody? 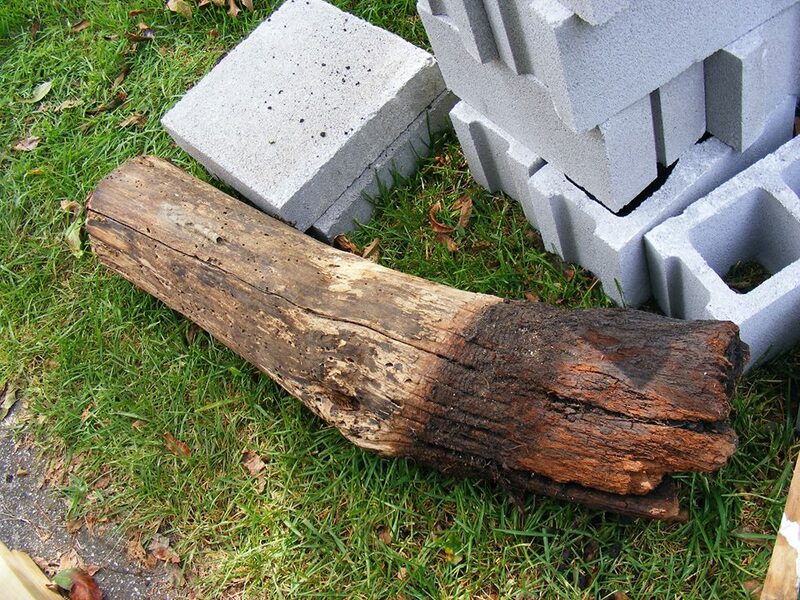 Bodarc (also called Osage Orange, Post Oak, or Horseapple trees around these parts) is a very hard wood that is practically impervious to bugs and rot. It was used as pilings for raised building construction all over the south from the 1800’s to about 1960. Most of these were still in good condition but one was slightly hollow and the termites were using it as an elevator to attack the porch lumber. I could have reused them, I will add a termite barrier (essentially cap them with a piece of flashing) to any I work on under the house, but I needed to move them around for better framing and structural support for the porch so I figured I’d just replace them. Here’s one shown for size. This weighs in at about 200 pounds. Bodarc is flat out heavy. Not in bad condition for 115+ years in the ground. It is still solid as a rock. It’s difficult to drive a deck screw into this wood. Here’s one shown for size. 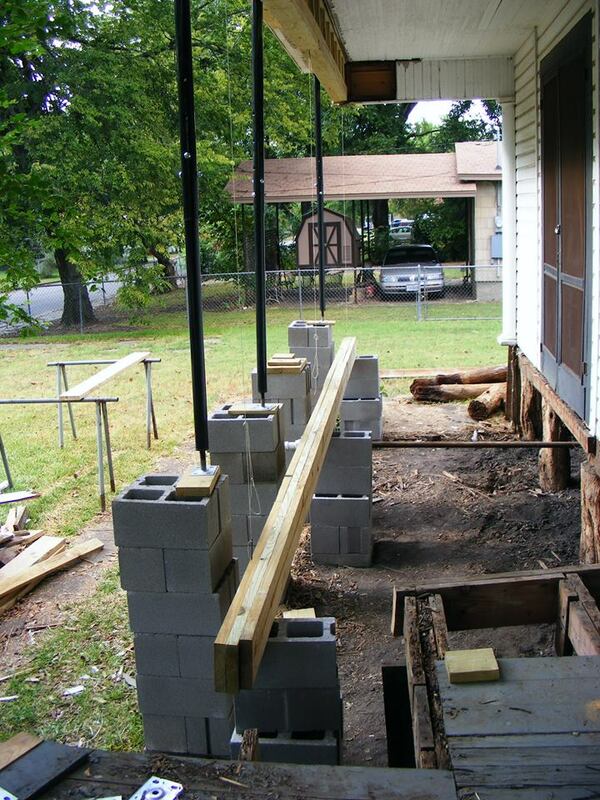 Next we built a beam to go across the 20ish foot front section of the porch. This will hold all the column weight. Next we positioned the piers and filled them with concrete. Yes, I know in this pic the middle one looks off-level. It is not. That’s a frame of reference thing with the gas pipe and the temporary pier. Piers set and filled with concrete. No, I don’t have to go down six feet here (or even one). 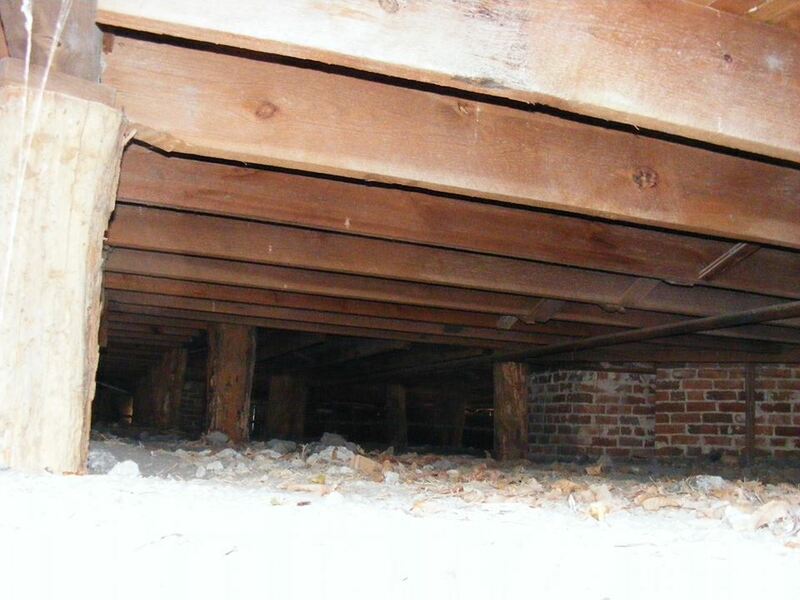 Some of the framing under the house. All my structural issues will be around the edges…particularly the front/porch thing…as the box gutters (which are long gone) they liked to use in this era were…to put it mildly…problematic. 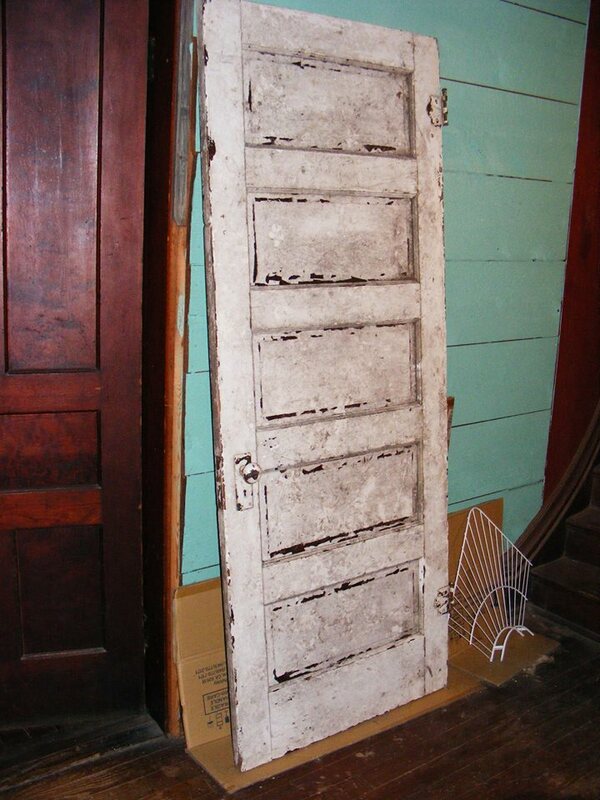 Oh, and a trip to the dump with a truckload full of rotten wood netted me…a new door! But I couldn’t let it lie…it’s not rotten, (just dirty) no significant dings, no splits or cracks, and it even has the hardware on it. When I finally figure out what doors I DON’T need…I’ll clean ’em up and put ’em up for sale. They tend to fetch a reasonable sum. I presume you fill the piers with concrete for increased stability? Correct. Just helps keep everything together and increases strength. Also keeps bugs/etc from using them as an enclosed elevator..